An American in Sochi who wanted to take one of the city's adorable stray dogs home with her is having more problems than she expected. Amanda Bird, a former competitive bobsled athlete and the spokesperson for the U.S. bobsled team, had announced that she wanted to adopt a stray from the shelter set up by Russian aluminum billionaire Oleg Deripaska. "I am very hopeful to bring home a dog from my trip here. My husband is too," Bird had said. "We would like to name her Sochi." But now, things aren't going so smoothly for Bird and her would-be pet -- she's having difficulties getting the animal out of the city. "It's just getting the pup home that's complicated," Bird told Bloomberg News. "I'm on a chartered flight that will not allow the dog. But if I get the dog to Munich, I should be fine taking the pup to my United flight to the U.S."
Bird plans to visit the shelter early next week to pick out her new pup, as long as she can find a way to get him on the plane. Another Sochi visitor, Gus Kenworthy, has also been making headlines this week for posing with Sochi strays -- and is hoping to adopt some of them as well. Well, we're hoping we will be able to help get them out and get them adopted. There is all sorts of red tape and logistical issues, and we also need to establish that we are bona fide and responsible to the local people. 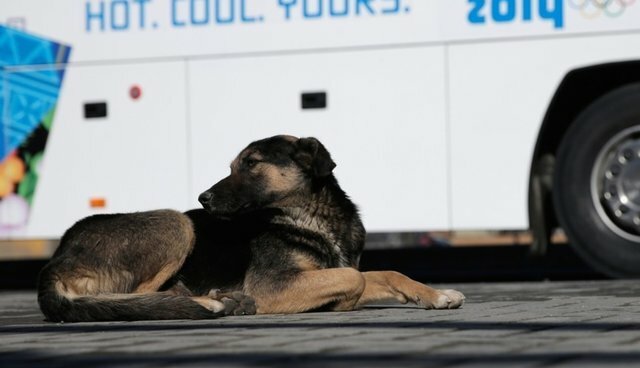 But we're in touch with a group in London and people on the ground in Sochi and in Moscow, and are currently reaching out to airlines that could help transport the dogs. There are organizations that have expressed great interest in taking the dogs, and I have absolutely no doubt about bringing them to this country -- there would be no shortage of families wanting to adopt the dogs.